Take in the sights of Bryce from the trail on some of the park’s best short hikes. A relatively small national park, southwestern Utah’s Bryce Canyon National Park attracts visitors who want to experience a truly unique desert environment. Here, nature has cut away rock and formed massive amphitheatres, lofty pillars and hoodoos and statuesque rock formations, all of which play with the human mind and imagination. Here are a few short hikes in Bryce Canyon for the visitor who doesn’t have more than a day or two and still wants to experience it all. Be sure to bring plenty of water and sunscreen, as many Bryce Canyon trails offer little to no shelter from the hot sun. This short hike has the added value of being at the end of the main park road, giving you a great excuse to take a scenic drive through the park on your way to the trailhead. From Rainbow point, this easy loop circles around one of the highest points of the park, providing spectacular views of Table Cliff; Kaibab Plateau; Navajo Mountain; and an especially clear sight of The Promontory, a solitary, pink peak just to the southeast. In addition to the ancient Bristlecone Pines, you’ll walk through forests composed of Blue Spruce and Douglas and White Firs. While you’re here, add on a quick stroll down to Yovimpa Point, a superb overlook of the Grand Staircase, which highlights the multi-colored rock layers found in Bryce Canyon. This must-do loop has been called “The Best 3-mile Hike in the World”, and not without reason. Along it, you’ll see a number of curious natural creations and classic Bryce Canyon scenery. From Sunset Point, take the Queens Garden Trail (the easiest way to descend from the rim) and wind down red hillsides through fins and hoodoos until you reach the Queens Garden, an imposing gathering of pillars that includes Queen Victoria, a pale-pink formation that has an uncanny resemblance to England’s famous ruler. From the Queens Garden, return to Sunset Point along the Navajo Loop, which passes through the narrow slot canyon of Wall Street; past Two Bridges; and next to Thor’s Hammer, a towering boulder-topped pillar that resembles the ancient Norse god holding his mighty hammer, Mjöllner. Swamp Canyon is one of the most surprising areas of Bryce Canyon National Park – the small wetland is hidden between tall fins and hoodoos, creating a sheltered refuge for plants and animals, including tiger salamanders, you won’t find anywhere else in the park. Start from the Swamp Canyon Overlook and descend into the lush vegetation of Swamp Canyon and the Under-the-Rim trail, where two creeks and a natural spring feed the willows, irises and green grasses. Along this trail, you’ll pass through four completely different habitat systems, making it an exceptional trail for bird viewing. If you’d like to explore this area some more, take a quick walk along the Under-the-Rim Trail, a 23-mile trail that runs the length of the park. This trail leads down from Bryce Point to the Under-the-Rim trail and on to one of Bryce’s most unique areas, where gray boulders (‘hats’) perch atop tall orange pillars. Along the way, you’ll be treated to more of the large rock formations that Bryce Canyon is famous for as well as views of the Paria River. 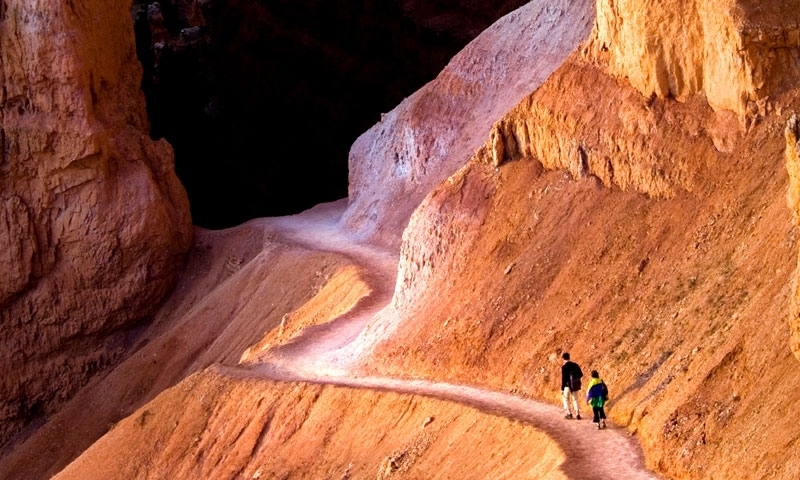 This trail is also less-traveled than many of the other Bryce Canyon trails, making it a tranquil escape from the hustle and bustle of the main road. The Rim Trail is likely the quintessential Bryce Canyon National Park Trail. The 5.5 mile-long trail stretches between Fairyland Point and Bryce Point, providing marvelous views of the main amphitheatres of the Park. While the entire trail can be hiked as an 11-mile out-and-back or a 5.5-mile one-way trip (by either shuttling a car or taking advantage of the free shuttle that runs during the summer), the Rim Trail connects with five different overlooks, giving hikers many options for closer destinations. The paved half-mile stretch between Sunset and Sunrise Points is the easiest section of trail, and can be extended to Inspiration Point to make an approximately 2.5-mile out-and-back.